I found that I've put here ridiculously little posts from the third biggest blockbuilding area in Tallinn: Väike-Õismäe, or just Õismäe in everyday talk (which might be confusing because Õismäe is a separate area right next to Väike-Õismäe). I try to fix my error now. 'Väike' means 'small' and 'Õismäe' means literally 'flower-hill'. The whole city is planned like a huge blossom of a flower and some of the busstop names are names of flowers: Sinilille, Karikakra, Kullerkupu, Nurmenuku. I include here a photo of the whole area very little after it was built or even during the building so you can get an idea what is it and understand better the subsequent photos in this and other posts. 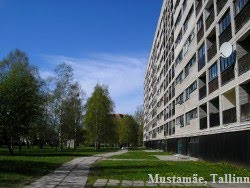 The book where this photo is taken from is "Tallinna arhitektuur", Tallinn "Eesti Raamat", 1987. This photo is so awesome that it was also used as the cover picture of that book. In addition, there is another flower-related area in Tallinn: Lilleküla, which means 'Flower-village'. Busttops there also have names of flowers but those names are shorter. That area is older too and closer to the center. So I visited this marvellous place after having lived in Tallinn for 2,5 months. It was a pain to wait so long!!! But I very much wanted to have the first impression of this without snow and in a sunny day! It was worth waiting! This is actually Astangu, a little sister area of Väike-Õismäe. I am still at the edge of Väike-Õismäe. Of course I couldn't skip the infamous lake in the center. The building that you see is really ONE building, probably the longest in Tallinn. I measured from an online map that it's length is 450 meters! And two photos from 08.05.05 when I didn't live in Tallinn yet so these may be my really first impressions and photos of Väike-Õismäe.